and continue stirring until all chips are melted. until all chips are melted. Pour melted semisweet chocolate over foil in prepared baking pan. With rubber spatula, evenly spread melted chocolate to edges of baking pan. Pour melted white chocolate lengthwise over center of semisweet chocolate layer. With tip of rubber spatula, gently swirl white chocolate into layer of semisweet chocolate. 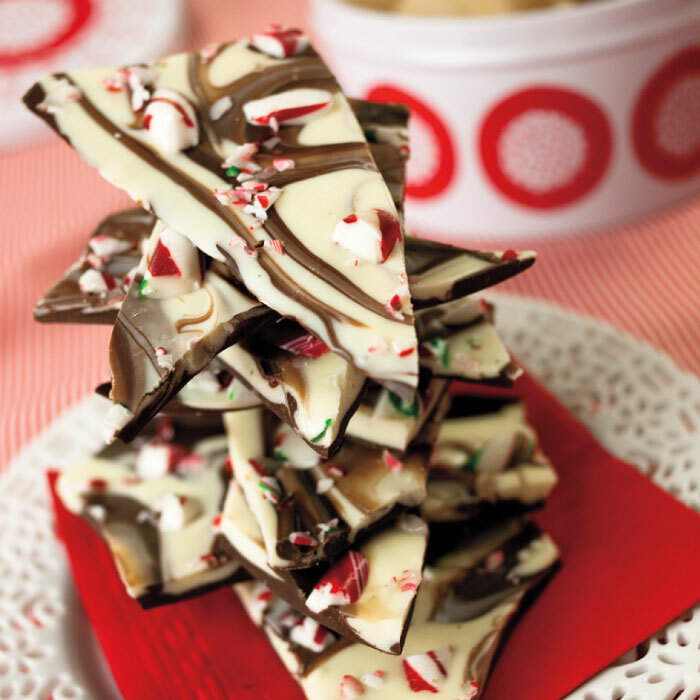 Evenly sprinkle candy pieces over top of chocolate layers. Tap pan on work surface to remove any air bubbles. Refrigerate at least 45 minutes. Peel off foil, then break into large pieces. Store bark in airtight container in refrigerator for up to 2 weeks.